Citation: C N Trueman "Thurgood Marshall"
Thurgood Marshall was the first African-American to be appointed to the Supreme Court – a major milestone in the cause of civil rights. Marshall left a significant mark on recent American history. 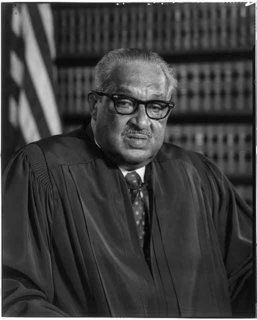 Thurgood Marshall was born on July 2nd, 1908.He was named Thoroughgood by his parents, after his great-grandfather, but he found the Christian name just too much of a mouthful and shortened it to Thurgood. He was born in Baltimore, Maryland. He graduated from his high school and decided to pursue a career in dentistry. However this quickly changed to law. It was now that he hit a very overt form of racism that pervaded many parts of America. He applied to the University of Maryland’s Law School but was rejected as the college had a policy of segregation. Rejected by this law school, Marshall went to Howard University, Washington DC, instead. At Howard, he graduated with a law degree in 1933. While Marshall was at Howard, he came under the influence of Charles Hamilton Houston, who instilled into Marshall the importance of upholding the Constitution. Houston also pushed home his belief that the 1898 ruling in Plessy v Ferguson that separate but equal was legal, should be overturned. In 1934, he started to work for the Baltimore NAACP and two years later he joined its national legal staff. His first major case was in 1936 when he represented Donald Gaines Murray, a student, who like Marshall, had been denied admission to the University of Maryland Law School. Murray had a BA from Amherst College and had the criteria to get a place at the law school. He claimed that his rights as guaranteed by the 14th Amendment had been violated. Marshall won the case. In 1938, Marshall became the NAACP’s chief legal officer. Marshall won his first Supreme Court case (Chambers v Florida) in 1940. In the same year, he was appointed Chief Counsel for the NAACP. He built up an enviable record of success – but his most famous case was Brown v Board of Topeka in 1954. In this case, the Supreme Court ruled that separate but equal could not be acceptable as it was clear from the evidence that was presented to the court that schools that taught black children in the south were definitely separate but they were anything but equal. Brown v Topeka made the concept of ‘separate but equal’ illegal. He was also involved in the Little Rock High School case when in 1958 the court rejected the request by the school board to postpone the immediate desegregation of Central High School, Little Rock, Arkansas. In all his cases in the Supreme Court, Marshall won 29 out of 32 cases. In 1961, J F Kennedy appointed Marshall to the US Court of Appeals for the Second Circuit. He served on this until 1965 – though his appointment started as a ‘recess appointment’ as some Senators from the south held up the appointments process. Marshall served as a Supreme Court judge for 24 years. He gained a reputation for being a moderate liberal who was opposed to the death penalty. He also enjoyed a reputation for being a fierce supporter of an individual’s constitutional rights. On June 27th 1991, Thurgood Marshall retired as a result of ill-health. He died aged 84, on January 24th, 1993.